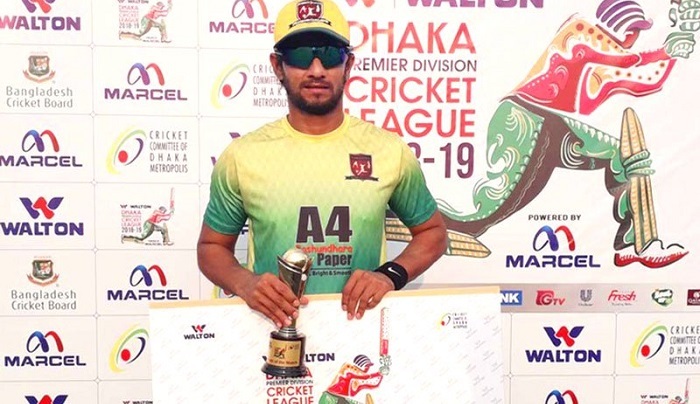 Sheikh Jamal Dhanmondi Club showed some quality cricket on Friday, beating Mohammedan Sporting Club by two wickets in Dhaka Premier Division Cricket League (DPDCL) in a last-ball thriller. Sheikh Jamal needed five runs in the last ball when all-rounder Enamul Haque hit a six off Alauddin Babu to seal the match in Savar. Mohammedan batted first on the batting-friendly pitch but failed to post a big total. They were all out for 240 in 49.1 overs. Only Abdul Mazid (52) hit a half-century. Mohammad Ashraful (44), Chaturanga de Silva (49) and Sohag Gazi (32) played some decent shots. Sheikh Jamal's Salahuddin Shakil took three wickets while Asela Gunaratne bagged two. Chasing the target, Sheikh Jamal lost wickets at regular intervals. Opener Imtiaz Hossain posted 74, the team's highest individual score. Tanbir Hyder (39), Nasir Hossain (20), Nurul Hasan (32) and Enamul Haque-2 (28) also pushed their team to the second victory of the season (242/8 in 50 overs). Right-arm spinner Sohag Gazi took three wickets for Mohammedan while Chaturanga took two. It was Mohammedan's second defeat and Sheikh Jamal's second win in the season. In the day's other match, Legends of Rupganj beat Gazi Group Cricketers by eight wickets thanks to the massive 226-run third-wicket stand between Mehedi Maruf and Jaker Ali. Both of them hit centuries. Rupganj won the toss and decided to bowl first. Gazi posted 259 for nine wickets in 50 overs at Sher-e-Bangla National Cricket Stadium. Parvez Rasool (86), Imrul Kayes (48) and Rony Talukdar (29) were the best batsmen for Gazi. For Rupganj, Muktar Ali bagged two wickets while Mohammad Shahid, Rishi Dhawan, Naeem Islam Minhazur Rahman took one each. While replying, Rupganj lost two wickets in 27 runs. However, in the third wicket stand, Maruf and Jaker posted 226 runs and won the game for their team (253/2 in 45.3 overs).